When your students are doing independent word work activities, are they reading the words? 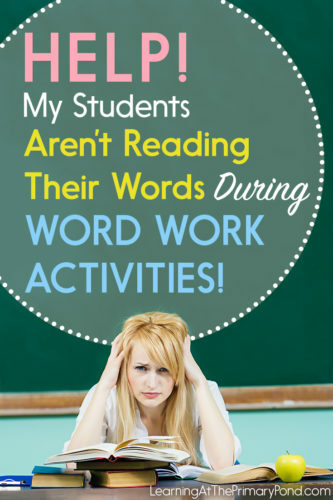 So many times, I’ve noticed that unless I’m standing right there, reminding my kids to read their words, word work turns into something silent and passive! For example, students might be making words with magnetic letters, using word flashcards as a guide…but then they don’t read the words out loud! Or maybe they’re doing sorts, and they’re grouping the words correctly…but they’re not reading the words during or after the sort! This is not the point of word work; we know that we want our students to practice making, writing, AND reading these words. So what can we do about it? I have 4 suggestions to share with you in this post! When you’re studying a specific word feature, there’s a variety of words you might have students study. Choosing words carefully can increase the chances that students will actually read them. When you choose words for students to practice independently, choose words that they can read AND words that they will use. Words they can read: It’s not a bad thing to challenge students, especially when you’re there to support them. But independent work should be at their level. So if students are struggling to read lots of the words, they might not be as likely to attempt them on their own. If I give my students 10-20 words to work on, I try to include only one word that’s a little bit tricky. Words they will use: The other week, I was working with a student on words with “sh” or “ch” digraphs and short vowels. Words that I chose for her independent work included “chip,” “shut,” and “shop.” I omitted words like “shag.” Even though she could read “shag,” it wasn’t as meaningful to her as the other words. She wasn’t going to use it much in her reading and writing — so I left it out. Remember, even if you don’t have students practice with tricky words and less-common words, it doesn’t mean you have to exclude them altogether. Maybe you use those words in small group activities. Maybe you test students using those words so you can see if they can apply the patterns to read and write new words. 2. Discuss the meaning of the words. If you want students to read and think about the words they are studying, it helps to discuss the words’ meanings when you introduce them. For example, if I’m seeing a small group that is contrasting the ‘ou’ and ‘ow’ spelling patterns, we read each word, discuss its meaning, and then sort it. If you want students to read and think about the words they are studying, make sure to model that when you introduce the words in the first place. I train my students to hold each other accountable for reading words! 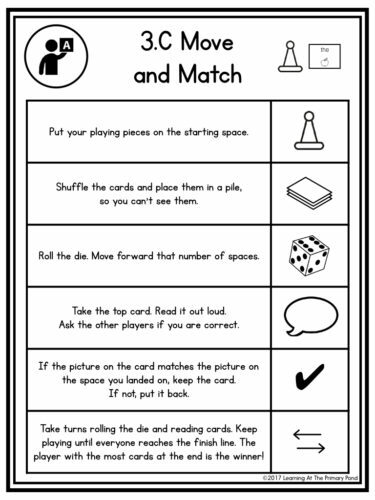 If students are playing a partner game, I teach word reading as a step in the game. I use visual directions as a reminder (my kids know that the speech bubble means they have to read the word out loud). When all else fails, I incorporate technology to hold my kids accountable for reading their words! If they are making words with magnetic letters, they can video or audio-record themselves reading the words. For this, I especially love Seesaw, an app that allows students to submit their videos to you for review. It only takes a minute, and it’s a super simple accountability method. You can read more about Seesaw HERE. Do you have any additional tips to share? Please do so in a comment! And if you’re looking for engaging word work activities for your K-2 students, you can check some out in my TpT store here. Happy teaching!